← Yoga Tunes: Turn Them Up or Turn Them Off? I’ve often thought it funny that so many people pay to take restorative yoga and meditation classes. Yes, I’m a yoga teacher, and yes, I have taught both restorative yoga and meditation to paying customers; I am thankful for these paying customers, for they are the reason I can afford my groceries. What I find funny is that so many of us won’t relax, won’t slow down, won’t take deep breaths, without a professional teacher telling us to. I grew up on a bison farm in western New York where my father was the primary farmer. Despite this being a “stay-at-home job,” come hay season (late May-early September), I hardly saw him. Anyone who farms knows that a farmer is at the mercy of Mother Nature. Anyone who pays attention to the weather (and news) might also realize that we are all, in fact, at the mercy of Mother Nature: when it is sunny and temperate, we flock to the outdoors; when it rains or snows, we cover ourselves and rush indoors; during a heat wave, we worry about sun burn and heat stroke; during a cold snap, our heating bill skyrockets and we curse our ancestors for ever deciding to settle in such a horrid place. On the farm, a hot, dry day meant my father would be mowing, raking, and bailing hay until sunset; a rainy day, on the other hand, meant the grass was too soggy to rake and bail, and my father was obliged to stay indoors. Instead of coming downstairs to an empty kitchen, I would find my father sitting at our island, finishing his giant bowl of cereal and reading a National Geographic. My mother followed a similar pattern: though not a fulltime farmer, she spent her share of time outside. Whether running, biking, or gardening, she was an outdoors kind of woman. Rain, however, afforded her some time to stay under our roof, free of guilt—a rainy day was a fine day to clean up her desk, practice the piano, or sit in the kitchen in her bathrobe, sipping tea and listening to classical 91.5. Most of my yoga students know that I love the rain. On rainy mornings like this one, they remind me of this fact: “You must love this weather, eh?” or sometimes even, “I blame you for this weather, Abby!” (all said in good spirits, of course). And it’s true: I do love the rain. But I didn’t realize why until today, when one of my students asked me, “Why do you love the rain?” For the first time, I analyzed my feelings on precipitation: First of all, I thought, rain makes plants lush and healthy, and makes the color contrasts richer: brown bark and green leaves, blue-grey sky and black pavement, true-blue sky peeking around dark clouds, a clear stripe of sun burning through fuzzy, humid air. But even more than the rain itself is what it implies: warm socks, an afternoon nap, settling on the couch to watch an episode of Parks and Recreation, more people in my yoga classes, and above all, moving slower. Although I am skilled in helping others relax, I often find it difficult to apply these skills to myself. When it’s sunny and warm, I feel compelled to go running—even if I don’t especially want to, I think I should (because in Rochester, sunny days won’t last forever!). When faced with the choice to relax in front of a movie or straighten up around the house, I generally choose straightening up (because what better way to get ahead than use one’s down time productively?). Of course, there is nothing wrong with keeping busy and active—in fact, there are many things right about it. There is a difference, however, between keeping busy for the joy of it, and keeping busy because we think we have to; while the former yields more joy, the latter often breeds resentment and stress. Perhaps it is no wonder so many of us need to step into a yoga studio in order to relax: since “go to yoga” is something we can check off a to-do list, we can feel like we did something. 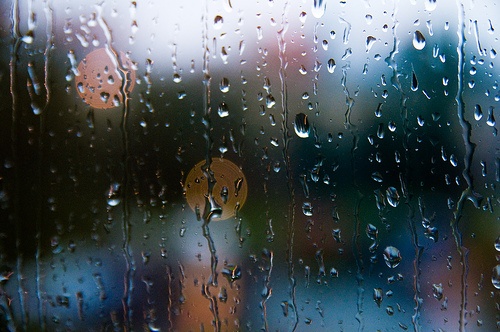 With the rain, however, I feel my to-do lists dissolve. I think of my parents, sitting inside, free of guilt, and remind myself: if they were allowed to relax on rainy days, so am I. 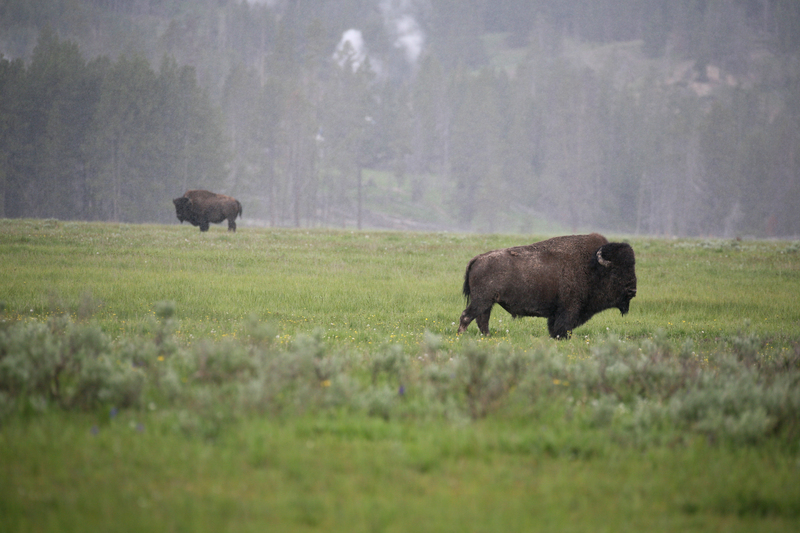 This entry was posted in Uncategorized and tagged bison, buffalo, farm, inside, meditation, rain, rainy days, yoga. Bookmark the permalink. There are some of us who needs that push to pause. It sounds ironic but quite true. I have been described since I was young as having ants in my pants, and with yoga, in any style of yoga, I find I can pause, slow down, and be more meditative. It is one of those few times when my mind actually stops racing and I can only focus on what’s at hand – my practice. I love the rain, too, for many of the same reasons you do. It also makes us appreciate the nice days so much more.